The Tsimane, a tribe of indigenous people in the Amazon basin of Bolivia, have the lowest rates of cardiovascular disease ever measured in a human population. According to the University of California Santa Barbara (UCSB) scientists who study them, the Tsimane also have a remarkably low prevalence of high blood pressure and type 2 diabetes, despite having far from stick-thin average body mass index (BMI) scores. Seeking to understand the factors behind the tribe’s extraordinary collective well-being, the team have been steadily gathering data, through field visits to their tropical lowland villages, since 2002. 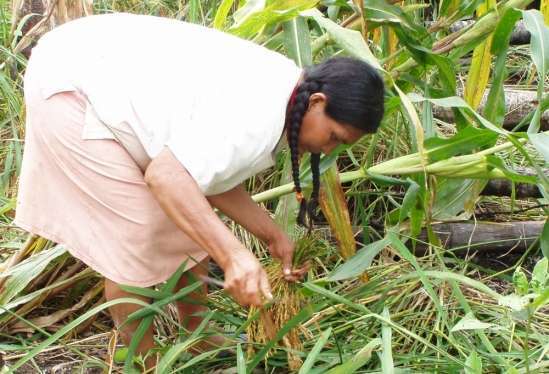 The resulting research, now published in the American Journal of Clinical Nutrition, was particularly timely as the tribe’s traditional lifestyle and diet is becoming increasingly modernized as access to broader Bolivian society grows, thanks to better roads and ownership of motorized boats. Through nearly 2,500 diet recall interviews with Tsimane people in 78 communities, Gurven’s group found that the typical diet is dominated by a high intake of carbohydrates (376-423 grams/day) and protein (119-139 g/d) and a low intake of fats (40-46 g/d). The total caloric intake per day was between 2422 and 2736 kcal, 64 percent of which was from complex carbohydrates. Though this number is on the high end of the range we westerners are used to hearing – 1600 to 2,400 kcal/day for adult women and 2,000 to 3,000 kcal/day for men, per the USDA recommendations – the researchers emphasize that tribe members are far less sedentary than the average modern human. Dietary diversity was found to be quite low compared to the average US diet, but this was not surprising given that the Tsimane are forager-horticulturists who subsist off wild foods and crops of plantain, manioc, rice, and corn. The researchers also discovered that total energy intake and carbohydrate intake increased over the five-year data collection period, particularly in villages located near developed towns with markets. This was likely attributable to the increased use of modern food additives. Through surveys, the team revealed that Tsimane people, on average, consumed 15.8 more grams of sugar per day and 4.9 mL more oil per day in 2015 than they did in 2010. Sadly, all signs indicate that rates of cardiovascular disease and diabetes among the Tsimane will soon increase, as their diet is veering closer and closer toward that of mainstream Bolivians’. However, the insights gained about their traditional diet provides helpful evidence that can be used to dispel overhyped, fad diets claiming to be the holy grail of health. Because other research has proved that different diets also lead to cardiovascular wellness – like the Mediterranean or Okinawan – Gurven and his colleagues conclude that their study helps support the theory that no one regimen holds the secret key. “It definitely sheds light on the diversity of diets that are compatible with good cardiovascular health,” lead author Thomas Kraft added.